Till now you must be aware that what a food dehydrator can do and what are its﻿﻿ b﻿﻿enefits. But what will you do if you have a small budget and still want to have advantages of this fantastic appliance? Well, don’t worry we will help you to overcome this situation. There are several brands and models of food dehydrators that you can easily find in the market or at the online shopping websites. All these products not only vary in features but also differ in their costs. So, if you want to buy a cheap food dehydrator for your home and also for your family members, then you can only pick one of them from the list which we are given below in this article. What are all the Features We Can Expect in This Price Range? What Features We Cannot Expect in Cheap Dehydrator Price Range? We are reviewing all the products which are below the price range of $50 so that it can be regarded as a low price and also affordable to many buyers. There are few features like an adjustable thermostat, warranty period and airflow systems (vertical or horizontal) are also kept in mind while choosing all the cheap food dehydrators. Even if you are going for a cheap food dehydrator, it does not mean that you can select the appliance of any local brand. Thus in our list, we have only chosen the products that belong to a reputed or renowned brand that is easily obtainable in the market. All the cheap food dehydrators Do of ample space for drying food items so that you can easily dry out food for a big get-together or a party. So, if you have a big family, then you can go for a cheap dehydrator that is larger in size. There is mainly two ways through which air flows in the dehydrator i.e. either horizontally or vertically. The cheap food dryers which have horizontal air flow are little more costly due to some benefits like no rotation of trays is required. In this price range, some of the food dehydrators will have less wattage that requires less power consumption. So, you can save your money that you might have to spend in paying your electricity bills. All the cheap dehydrators do not have a ﻿﻿﻿thermostat ﻿﻿﻿function to regulate the temperature of the appliance during the drying process. The absence of this feature affects a lot if you want to dry out a different variety of food like jerky as well as herbs. Due to the presence of less wattage, your cheap food dehydrator will require more drying time. Thus, you have to wait for more for the complete dehydration of your food. The units which have a high wattage capacity fill out the dehydration process in very less time. Some of the best cheap dehydrator units do not come ﻿﻿with a﻿﻿ timer which automatically shuts down the appliance as soon as the process is over. This feature is available on the expensive models. So, if during the maximum time of the day you have to remain outside your home, then cheap dehydrators might not be your cup often for sure as you have to keep your eye on the appliance till the entire process gets over. As you are now more aware of the benefits and disadvantages which you will get after buying cheap food dehydrators, let's discuss regarding the top ten best cheap food dehydrators that you can buy from the market. We have reviewed all the products honestly and in brief detail so that you can make an appropriate decision in the end. The top name in the list is of P﻿resto 06300 Dehydro Electric Food Dehydrator which is of the best inexpensive food dehydrators that are accessible on the market. This amazing appliance mainly manufactured for the convenience and ease of the user. It is available at very affordable cost, but this does not mean it lacks any main features which you need in drying your desired vegetables and fruits. You can easily dehydrate everything i.e. from fruits to vegetables and even meat, pasta and milk powder. This product is very easy to use even for a beginner. There is ample of dehydrating space in this unit. This product also expanded up to eight trays. During the drying process, all the food gets evenly dried. It is a user-friendly and compact size appliance which can be run by any new person. There is no adjustable thermostat feature in this food dehydrator. It is a little bit noisy during the process of drying. It lacks timer also which wastes lots of time of the user. Sometimes the appliance gets hot during the process of drying. If you are looking for a budgeted and cheap food dehydrator, then this machine will undoubtedly encounter all of your beliefs. It is also an appetizer dehydrator for a new user who does not want to spend more in buying an expensive unit till the time they get perfect in the drying recipes techniques. 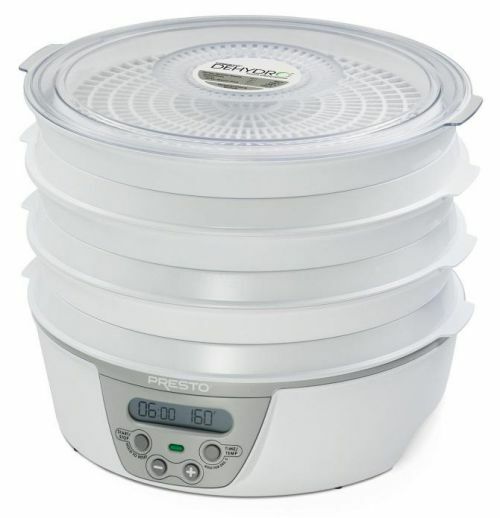 The Presto 06300 Dehydro electric food dehydrator has a life expectancy of 10 years if it accurately maintains. The next name in the list is of Nesco FD-60 Snackmaster Express which is one of the inexpensive and most prevalent drying machines which you can purchase today. Even though it does not consist of the numerous excellent features which you may found in other food dehydrators, but we are sure that this machine will proficiently do its drying job. You may relish many advantages of food dehydration without emptying your pocket. It becomes very easy to eat nutritious food after using this superb product. This cheap food dehydrator consists of adjustable thermostat feature so that you can change and set the temperature of the appliance as per your requirement. It leads to uniform and rapid drying. There is no need to rotate the trays in this dryer. The jerky spices and fruit roll sheets included in the packing of the product. You can only expand it up to twelve trays. This appliance is a little bit noisy so you cannot use it during the night time without disturbing your family member's sleep. There is no “OFF” switch given on the unit. In consort with numerous benefits stated above, Nesco FD-60 Snackmaster Express Food Dehydrator is also accessible at a quite reasonable price. This cheap dehydrator not only benefits in preserving the food but it also saves your lot of money which you need to spend in purchasing dehydrated food at suitable stores. The food dried in this dehydrator is not a healthier to consume, but you also know that it does not include any artificial preservatives. It’s clear that this food dehydrator does have certain shortcomings, but it look like that all the benefits overshadow the weaknesses. The Nesco FD-75A Snackmaster Pro Food Dehydrator offers a good experience for its buyers and certifies that they paid out little on its buying. 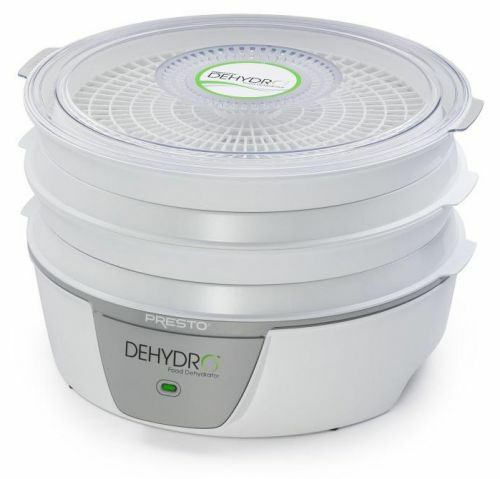 After reviewing several food dehydrators, this cheap food dehydrator is a sniff of fresh air. It is also not a very costly product. Also, this appliance is presentable and smaller in size. Thus, if you keep this dehydrator on your kitchen shelf, then we are sure kit will add more beauty to your kitchen gallery. The fan of this cheap food dehydrator results in faster and efficient drying. An instruction booklet is also provided along with the product so that the user can make the best use of the appliance in a straightforward manner. The design of this best cheap dehydrator is also quite comfortable which makes it compatible with any kitchen counter. You can also expand this product by adding more trays (maximum 12 trays). There is no ON/OFF switch given on this unit, so you have to plug it out to check the status of the drying process. You will not get any timer on this appliance, so you have to keep your eye open while making anything in this food dehydrator. If this unit gets to break down, then it will be very costly to repair. 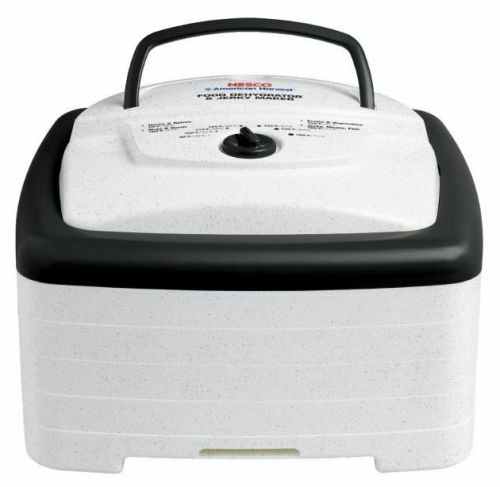 Nesco FD-75A Snackmaster Pro Food Dehydrator is a useful appliance for an average to a judicious user, along with the “novices." Due to the presence of adjustable thermostat feature, you can only dry a variety of foods in very short span of time. Overall, this cheap food dehydrator offers outstanding value as per its price. The main flaw regarding this dryer is that it does not have a timer. Thus, to overcome this lacking you can buy an electrical outlet timer. The next name in the list is of Nesco FD-61WHC Snackmaster Express Food Dehydrator All-In-One Kit with Jerky Gun which is a mid-range food dehydrator that has a lot of potentials. This is one of the best cheap dehydrator for beef jerky making. It is specially designed to benefit people with its several advantages of food drying without any extra price as well as time. Such mid-range appliance aims to provide delightful food items in very less span of time. It entirely equipped with a wide-ranging range of features that undeniably help the user in the process of dehydrating. Due to the existence of Converge-Flow technology all the food gets uniformly dried in the food dehydrator. This cheap food dehydrator can be expanded up to 12 trays. It also comes with a fruit roll sheet, jerky gun, and clean-a-sheet which makes it perfect as an appetizer model. This appliance is very easy to clean in a dishwasher safe as its heating elements as well as the fan are mount at the top. It is also comparatively quiet as compared to other cheap food dehydrators. It means that you can use it during the night. It does not have a timer an on/off switch that can be very inconvenient to the user. The food items can take the longer time to dehydrate than the usual, specifically for the thicker foods. The meat also gets stick over the trays. 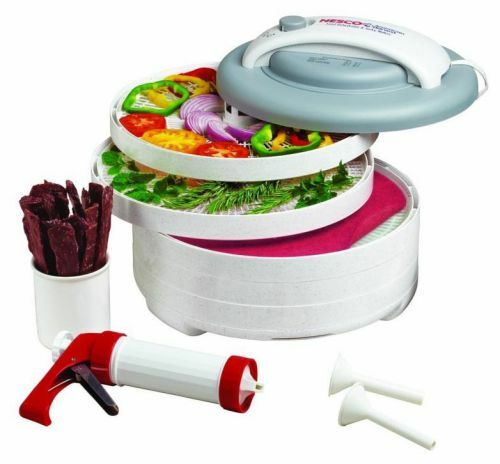 At the current price label, the Nesco FD-61WHC Snackmaster Express Food Dehydrator All-In-One Kit with Jerky Gun is a user-friendly appliance that will perfectly suit every single buyer that is considering buying a cheap food dehydrator. It is a real "discovery" product at present which is available on the market. Besides one of the best cheap dehydrator, this appliance consists of a full variety of enduring accessories, “healthy” materials, great fan and, good outcomes in the end. 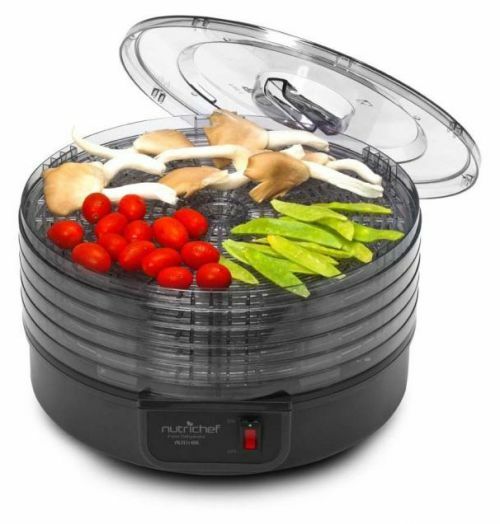 The NutriChef PKFD14BK Kitchen Electric Countertop Food Dehydrator and Food Preserver is one of the cheap food dehydrators which is an efficient, pocket-friendly, and a smaller unit as compared to the other models. The price of this appliance is pretty suitable to the average income people who can buy it without draining their budgets. As this food dehydrator is beautiful and small in size, you can easily place it inside the little kitchen cupboards. Owing to the presentable nature, it can upsurge the attractiveness and the whole outlook of your kitchen. The small size of this cheap dryer makes it suitable for any size of the kitchen, and you can easily carry it along with you from one place to another. The overall look and beautiful design of this product are very attractive and presentable which enhances the beauty of your kitchen. Furthermore, the adjustable capacity of this product also makes it entirely appropriate for the people who have different requirement of the food quantity. In this appliance, the vertical heating system which initiates from the bottom can result in the leakage of the food contents over the lower portions of the dehydrator. The leakage from the food can affect the functionality as well as overall performance of the appliance. It is not appropriate for the food products which consist of high levels of moisture like meat, fruits, vegetables, etc. NutriChef PKFD14BK Kitchen Electric Countertop Food Dehydrator & Food Preserver is a good cheap food dehydrator which possesses the capability to offer a high-end service that fulfills the desires of the users. It also has a cylindrical shape which comprises of a beautiful design. Also, the dehydrator is suitable and appropriate for the buyers that want high-grade appliances which are low-priced and small. This product is extremely functional and provides an outstanding experience to its users with very less expenditure. Flexzion Dehydrator for Food Fruit is one of the cheapest appliances that help in preserving vegetables, fruit, as well as animal proteins after drying them thoroughly. It judiciously eradicates moisture from the food items that support in their preservation with the help of heat source and air. Flexzion Dehydrator is an excellent way to preserve and lengthen the shelf life of many foods. It quickly removes water content from the fruits and vegetables. Due to the feature of an adjustable thermostat of 95 degrees F to 160 degrees F, you can dry a variety of foods at optimal temperature. The inbuilt fan is intended to help in drying all the food uniformly without overheating. The five stackable trays are available along with this product for easy and flexible food removal. In this appliance, the increased flow of air around the food results in more uniform and fast dehydration. The clear lid of this product allows for stress-free observing during the process of dehydration. The main disadvantage of this food dehydrator is that you have to rotate the top shelves to get better results. It is tough to find the replacement trays if it gets broken. So, the accessories and replacement parts are little difficult to find in the market sometimes. Flexzion Dehydrator for Food Fruit - Electric Food Saver Fruit Dehydrator Preserver Dry Fruit Dehydration Machine with 5 Stackable Tray is a useful appliance that offers you several features of dehydration at very less cost. The adjustable thermostat feature is one of the main benefits that you will not find easily in the models of the same range. If you are going to buy this product, then you will surely recommend to others after seeing its advantages. Nesco American Harvest FD-61 Snackmaster Encore Dehydrator and Jerky Maker is an outstanding choice for the individuals who have a mid-range budget. As regards to the price of the product, this appliance has attained an enormous deal of buyer satisfaction. Even if this all-in-one product originates with a small budget, you can make any dried food in just a few hours. Besides all this, it also inhabits certain features that are difficult to find in specific another expensive dehydrator also. This cheap food dehydrator is quite stress-free to operate. The process of drying out is faster and robust on the price. It is very easy to clean this food dehydrator. In fact, the during the entire dehydration process very less noise is made. 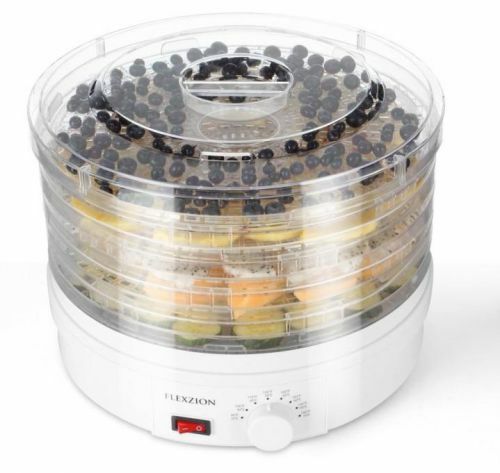 You will not get any timer in Nesco American Harvest FD-61 Snackmaster Encore Dehydrator. If your foodstuff is thicker like jerky, then this might take some longer time to dry out. There are no fruit rolls sheets that are offer with this product. If you are an inexpert person in using a food dehydrator, then Presto 06302 Dehydro Electric Food Dehydrator would be a perfect choice for sure. This cheap food dehydrator along with the adjustable thermostat offers you all the benefits of an innovative food dehydrator at an economical price. This appliance is very straightforward and easy to use even by a novice user. It requires just three basic footsteps to function i.e. load, set, as well as the plug-in. There are six trays which along with the appliance that offers ample of drying space. It can expand up to twelve trays. The availability of the cord storage in the base helps in saving 40% of the storage space. Two nonstick mesh screens are available along with this cheap food dehydrator. The presence of adjustable thermostat feature results in actually better uniform drying. The stackable trays of the product lead to a smooth operation and proper storage. The drying trays are also dishwasher safe which helps a lot of time of the user. It creates little noisy during the functioning period. There is no ON/OFF switch, so you have to plug-in or unplug the appliance to start or stop the operation. We admire the whole thing about this food dehydrator i.e. from the large drying space to the feature of an adjustable thermostat. One main flaw is that its fan is a little bit noisy, but this also happens with a maximum number of other units. Besides this, all type of foods gets dried out rapidly and consistently, so that you can relish healthy and fresh snacks prepared at your home. 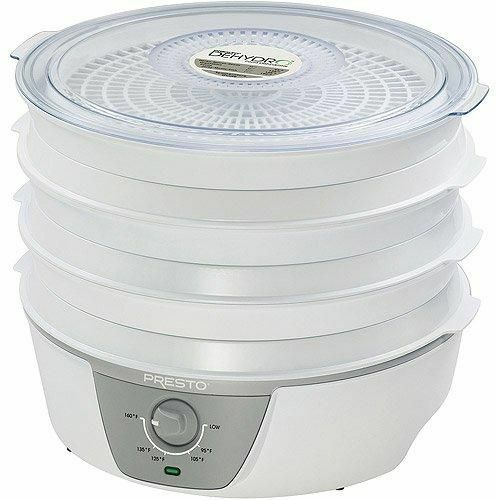 Presto 06302 Dehydro Electric Food Dehydrator with Adjustable Thermostat is a great appliance for both i.e. experienced users and beginners according to the price it offers. The Presto 06301 Dehydro Digital Electrical Food Dehydrator is a pocket-friendly appliance which offers healthy homemade-dried food in just a few hours. This machine is very simple and easy to operate also. Even if the user does not have any previous experience in using a dehydrating machine, then Presto 06301 is a good choice for him/her. In fact, this appliance does not lag behind regarding features as it is well equipped with a lot of elite elements toentirely change the method of food preservation entirely. There is a lot of drying space along with the six, and you can also expand them as per your need. It is very easy to set the drying time and temperature along with the help of thermostat and a timer separately. There is no need to do any tray rotation or food spinning in this appliance. Presto 06301 doesn’t occupy huge space in the kitchen. It is inexpensive as compared to the similar food dehydrators. This product does not comprise of strong construction which shortens its life span also. The extra trays and accessories of this product are available at a higher price. This cheap food dehydrator is not appropriate for the people who wish to dehydrate large quantities of foodstuff in one single point of time. All things considered, there are lots of things that we like about the Presto 06301 Dehydrator. The device is not completely perfect, but its little weaknesses must not be reflected as deal breakers. The one year limited warranty, excellent performance and the low price results in the exceptional overall value. Even if you’re looking to dehydrate vegetables, meats or fruits, this cheap food dehydrator is fully capable of getting your job done accurately. When you visit medical professionals, most of them keep telling to consume 5 or more servings of the healthy food in one single day. 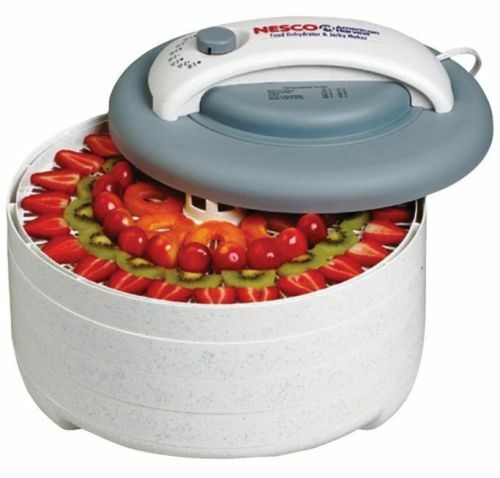 In this situation, the Nesco American Harvest FD-80 Square-Shaped Dehydrator will help you to come out. 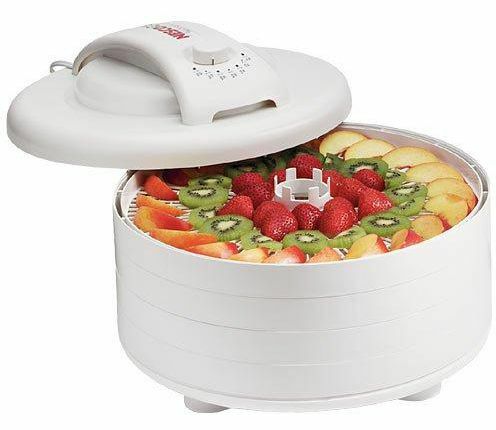 This cheap food dehydrator device not only dries your vegetables and fruits but also preserves lot of nutrients and minerals which they comprise. A new user can also use this product with very ease as this is not a complicated machine. Furthermore, the device also helps you to save your precious time and money which you might have to spend in buying dried snacks at stores. The smaller footprint of this unit allows fitting comfortably on the counter of your kitchen. The feature of adjustable thermostat also leads to the appropriate temperature for any food category. The square trays offer more space and are also quite stress-free to load as compared to the round trays. The drying also happens faster owing to the more powerful heater. This product is not as much expandable like any other expensive food dehydrators. There is no on/off switch on this appliance which makes it very inconvenient o the user. A timer is also not given which makes you monitor the unit more cautiously. The Nesco FD-80A Square-Shaped Dehydrator is an attractively designed and efficient food dehydrator which is available at the modest price. Its base capacity might be small, but that can be effortlessly expanded. Overall, this is an excellent product regarding both i.e. design and quality. We cannot disagree that this cheap dryer has certain weaknesses, for example, it is more suitable for the smaller families. However, in spite of these problems, it functions efficiently. The drawbacks of this appliance are not very dangerous and resolved in some other ways. The quality of the best cheap food dehydrator must be strong enough that it can serve you for several years. You should consider buying that appliance which has strong material built-up i.e. either stainless steel or plastic. This strong material also benefits in facing the high temperature during the process of dehydration. The cheap food dehydrator must include all the necessary features that you might need in your appliance. If you have a busy, hectic schedule and do not have enough time to check your food item in between the dehydration process, then it will be advisable to go for a product which has in built timer. It might be little costly, but this feature is also available in some dehydrators. The manufacturers of almost all branded dehydrators offer minimum warranty period of one year, and it can be extended in few cases. Thus, before buying any cheap dryer, you must check the term of warranty which its manufacturers offer to you. In case, if your appliance gets to break down or you want to change its any part, then you must check whether these replacement parts are available in the market or not. If parts are not readily accessible, then this might frustrate you in the future. Q: I Have Heard from Many People That It Is Not Worthy to Buy a Cheap Food Dehydrator at all. Is This True? No, this is not entirely accurate. Many food dehydrators are not only available at the low price but also equipped with numerous features which are available in only expensive models. Q: What Type of Features are Mostly absent in the Cheap Food Dehydrators? The features like timer, adjustable thermostat, expandability, etc. are available in the very less cheap food dehydrators category. Q: Do the Manufacturers of the Food Dehydrators Which are available at Low Price offer Warranty Period to Its Buyers? Yes, of course, the manufacturers of such food dehydrators also offer warranty period benefit to its buyers. 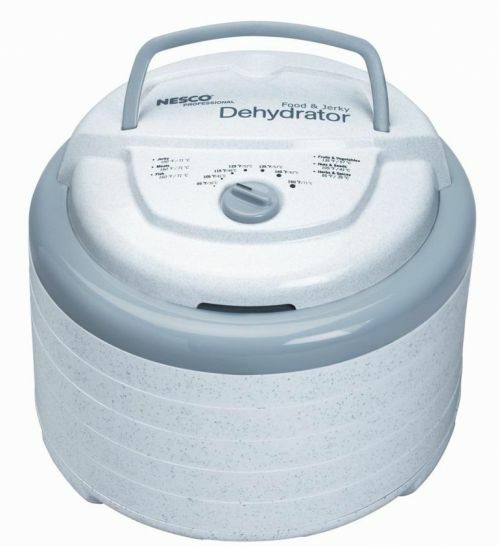 Q: Does the Cheap Food Dehydrators always Lack Essential Features Which are Important in the Food Dehydration Process? No, we will not agree with this statement. It is not mandatory that such dehydrators lack any significant features which you need during the food dehydration. This directly varies with the decision which you make while selecting the product. Q: the Maximum Number of Cheap Food Dehydrators Has Less Wattage Power. What Does This Mean? Is It Useful? Yes, the maximum number of cheap food dehydrators possesses less power capacity or wattage. This less power capacity results in less power consumption which reduces the number of units consumed in using electricity. But the only disadvantage of this feature is that it leads to slower drying process that might take some additional time. Q: I Have a Very Low Budget for Buying a Food Dehydrator. but I Want to Have an adjustable thermostat Feature in It also. Is This Possible? If you are looking for a cheap dehydrator, then the adjustable thermostat feature might not be available in that product. To have this feature, you have to increase your budget to some extent. Q: Will It Be Beneficial If a Beginner Like Me to Buy a Cheap Food Dehydrator? Yes, of course, it will be beneficial decision to buy a cheap food dryer if you are a beginner. Once you get trained in the dehydration technique, then you can go for an expensive dryer that is used by professionals. Q: are the additional Parts or accessories of Cheap Food Dehydrators Easily Obtainable in the Market? 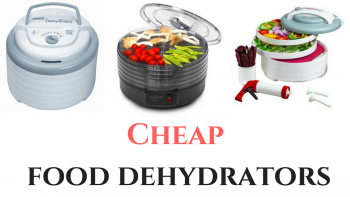 Yes, all the parts and accessories of cheap food dehydrators are easily available in the market or at the online shopping websites like amazon.com for sure. Q: some People Say That Cheap Dehydrators Lack of Large Space availability. Is This True? Yes, a maximum number of cheap food dehydrators lack large space feature and also the number of trays. To overcome this problem you can go for the appliance which has the expandability feature. In the last, we can say it is a misconception in the mind of people that cheap food dehydrators are not optimal for their kitchen. We admit that they might lack advanced features, but the appliances which belong to this category also offer better service and benefits to the buyers. There are some features which are only accessible in the expensive or commercial food dehydrators, but this does not mean that budget-friendly cheap dryers are anyway lesser to them. In the above article, we have reviewed the top ten best cheap food dehydrators after thorough study and research. We have tried our best to tell you the brief detail about all the products along with the pros and cons so that you can easily make a useful decision in the end regarding the purchase. Before buying any of the above product, be sure to know your requirements first so that you can get all the desired features in that particular cheap dryer. One major thing this site lacks in is this: A lot of the cheaper models have warning labels on them. Like, chemicals, etc. It is best to go to manufacturers website to read all the warning labels before choosing to buy one. I been looking for one for awhile and I am a limited budget. I want a cheaper one without all the side effects and chemicals. One major drawback to this: The lack of warning labels. Most cheap dehydrators leak chemicals, etc. into the food. I would highly recommend going to the manufacturers website and read these warning labels. What. Rand do you use? If are asking about the brand, then I recommend Presto or Nesco in cheap dehydrator brand category.